This book is not for everybody. Remember that opening scene in AMERICAN BEAUTY, where Kevin Spacey was yanking himself in the shower? Yeah. Funny and realistic, but a bit uncomfortable. Right? 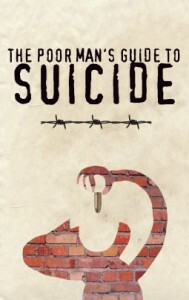 Well…THE POOR MAN’S GUIDE TO SUICIDE kind of goes in that same direction, and then some. I personally get it. I also have a twisted sense of humor. I often get raised eyebrows when I laugh at certain jokes. We all have different tolerances and mine borderlines on sick-o level. (Read more about this humor differential in THE HUMOR CODE.) Right off the bat, Andrew Armacost, the author, describes his character’s house as a “urinal with windows.” His life’s motto is “Survive. Eat. S[-]. F[-]. Buy a house and die.” This dude is depressed, mentally twisted, and unfortunately funny. Sick, but funny in a sardonic kind of way. 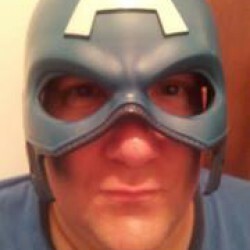 The good: humor and prison guard life. The ending was good, too, but we’ll get to that later. I’ve mentioned the humor above. As for prison guard life, it was interesting to see through the eyes of a former prison guard (as the author was…I think). I’ve read “ask me anything” threads on reddit and much of this life matches up with what is written here. There are obvious mental issues at play here, predominantly due to being grossly outnumbered by potential life-threateners. And, yeah, some of it may come off as borderline racist, but I feel the author was trying to convey the character and environment. The not-so-good: this book flutters around in the middle. We go back to high school, and college, and daddy/mommy issues, and previous girlfriends. He talks about killing a guy, flips back in time, and doesn’t get to the story until about fifty pages later. Dude! If you bring up killing a guy—tell me now. The non-spoilerish ending: ties it all together; keeps it real. Happiness is more than rainbows being spit out of prisms. There are “oodles and oddles of these smaller joys” to celebrate. Personal story time (I’ll keep it brief): I, too, was on the edge-of-your-life cliff. A bunch of things changed that, but one thing that echoes with Mr. Guard’s sentiments is what I found in HARDWIRING HAPPINESS. Stop. Pause. Be thankful for those small things. With that, I’m thankful to Ascot Media and the author for reaching out and sending me a copy of this book to review. It was an interesting journey, at times funny, but in the end worthy.